This is our 21st year renting margarita machines / daiquiri machines. 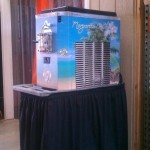 We have been leading the industry with our top of the line commercial margarita machines for many years now. Our customers love our super fast margarita machines. Our frozen drink machines freeze as fast as 10 -15 minutes with no down time when refilling. We offer our own branded margarita mix that we have been selling nationwide to other margarita machine rentals companies,bars,hotels and restaurants since 1998. You can choose from over 30 flavors when renting your frozen drink machine. You can choose from our original margarita mix ,top shelf margarita mix ,strawberry daiquiri/margarita,pina colada,peach bellini and many other flavors including kids flavors too. This entry was posted on Saturday, March 23rd, 2019 at 9:02 am	and is filed under News & Updates. You can follow any responses to this entry through the RSS 2.0 feed. You can leave a response, or trackback from your own site.